ParklandGEO was retained to design, supervise the construction and monitor the performance of a methane recovery system at the Lindsay Thurber Comprehensive High School. During the construction of a building addition, an old sanitary landfill was discovered immediately adjacent to the existing school building. High levels of methane were detected in the subsurface near the school and immediate remedial action was necessary to allow the school to remain occupied. 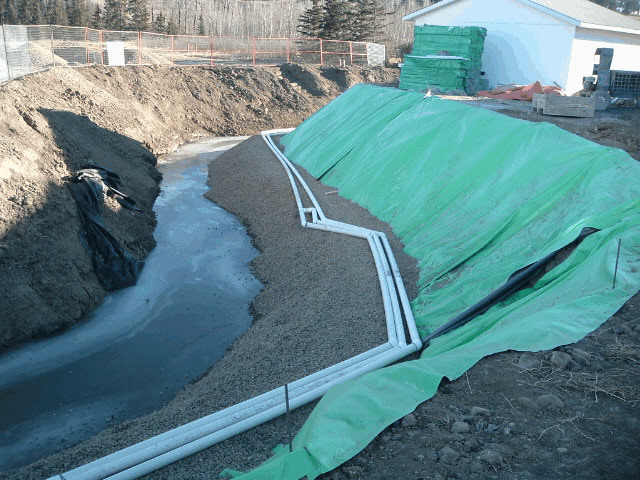 A soil vacuum extraction system was designed that would allow the recovery of methane vapours from immediately adjacent to the building by vertical wells, along with a barrier trench that would allow recovery of vapours through a horizontal trench excavated along the edge of the waste between the landfill and the school. The trench was lined with a geomembrane liner to further protect the school from the potential of methane vapour migration. After only a three months of operation, subsurface methane vapour concentrations between the school and the barrier trench had been reduced to a level that the vacuum extraction system was only required within the recovery trench. Monitoring continues throughout the area and methane extraction rates are monitored quarterly to gauge the effectiveness of the remediation system.